Musicians may soon be able to play instruments using just the power of the mind. Researchers at Goldsmiths, University of London have developed technology to translate thoughts into musical notes. 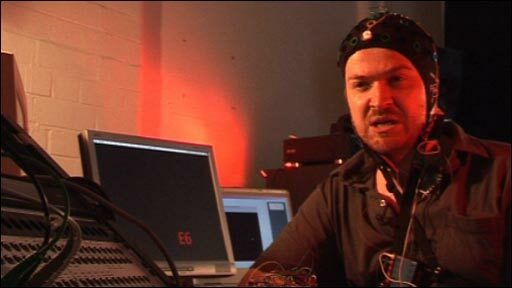 The Brain Computer Interface for Music requires electrodes to be attached to the head. They pick up electrical impulses from the brain which are passed through an electroencephalography (EEG) machine and analysed. The man behind the project, Dr Mick Grierson, demonstrated the system to BBC News. 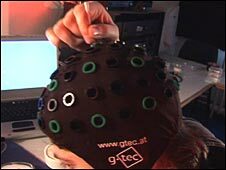 The brain monitoring device requires electrodes to be attached to the head through a cap. When musical notes flash the scientist stares at the display while thinking of a note he wants to play. When the same note appears it unconsciously triggers a change in his brain activity - a change registered by the computer he was plugged into. "After a while it will make a decision about which note I am thinking about and it tries to play it," he said. Dr Grierson has run trials in which 6 out of 8 notes played were the same as those being thought of. The project is supported by the Arts and Humanities Research Council and aims to find a way for people who have difficulty using their hands to play music. "There are many composers who are struck down with multiple sclerosis and other physical disabilities who still want to continue making music", said Dr Grierson. A number of research projects around the world are looking into using brain controlled interaction with computers to improve the lives of people with disabilities. Tokyo's Keio University has demonstrated robotic hands being controlled through thought processes. The research is also leading to commercial products. US and Australian firm Emotiv hopes to have a headset video game costing $299 on the market by the end of the year. It enables players to vanquish villains through thoughts and emotions without ever touching a controller.